This AZ Petrified Wood table top measures 38 x 31 1/4 x 1 inch. Stand not included. Please email for shipping charges. 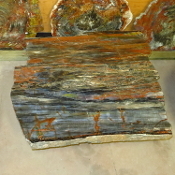 This AZ Petrified Wood table top measures 20 x 17 3/4 x 1 1/4 inches. Stand not included. Please email for shipping and handling charges. This AZ Petrified Wood table top measures 21 1/2 x 17 1/2 x 1 1/8 inch. Stand not included. Please email for shipping and handling charges. This AZ Petrified Wood table top measures 23 x 20 x 1 1/4 inches. Stand not included. Please email for shipping and handling charges. This AZ Petrified Wood table top measures 23 x 22 x 1 1/8 inch. Stand not included. Please email for shipping and handling charges. 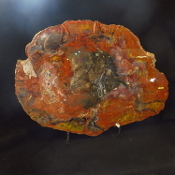 This AZ Petrified Wood table top measures 21 x 18 inches.Width varies from 1 to 1/2 an inch. Stand not included. Please email for shipping and handling charges. This AZ Petrified Wood table top measures 21 x 15 1/2 x 1 inch. Stand not included. Please email for shipping and handling charges. This AZ Petrified Wood table top measures 19 x 17 1/2 x 3/4 of an inch. Stand not included. Please email for shipping and handling charges. This AZ Petrified Wood table top measures 21 x 20 x 1 inch. Stand not included. Please email for shipping and handling charges. This AZ Petrified Wood table top measures 23 x 18 1/4 x 1 1/8 of an inch. Stand not included. Please email for shipping and handling charges. This AZ Petrified Wood table top measures 28 x 23 x 1 1/4 of an inch. Stand not included. Please email for shipping and handling charges. This AZ Petrified Wood table top measures 29 1/2 x 24 x 1 1/4 of an inch. Stand not included. Please email for shipping and handling charges. This AZ Petrified Wood table top measures 25 x 22 1/2 x 7/8 of an inch. Stand not included. Please email for shipping and handling charges. 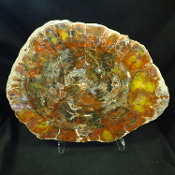 This AZ Navajo Petrified Wood table top measures 24 1/2 x 17 1/2 x 1 inch. Stand not included. Please email for shipping and handling charges. This AZ Petrified Wood table top measures 22 1/2 x 22 1/2 x 1 inch. Stand not included. Please email for shipping and handling charges. This AZ Petrified Wood table top measures 36 x 27 x 1 1/2 inches. Stand not included. Please email for shipping and handling charges. 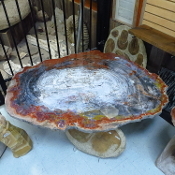 This AZ Petrified Wood Table Top measures 40 1/2 x 22 x 1 1/2 inches thick. Please email for shipping and handling charges. This AZ Petrified Wood table top measures 26 x 22 3/8 x 1 1/8 inches. Stand not included. Please email for shipping charges. This AZ Petrified Wood table top measures 41 3/4 x 39 1/2 x 1 3/8 inches. Stand not included. Please email for shipping charges. This AZ Petrified Wood table top measures 27 x 24 3/4 x 1 inch. Stand not included. Please email for shipping charges. 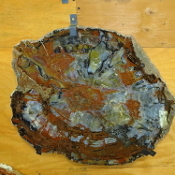 This AZ Petrified Wood table top measures 18 x 15 1/2 x 7/8 of an inch. Stand not included. Please email for shipping charges. This AZ Petrified Wood table top measures 20 7/8 x 13 1/2 x 1 inch. Stand not included. Please email for shipping charges. This AZ Petrified Wood table top measures 18 x 17 1/4 x 1 inch. It is missing some bark. Stand not included. Please email for shipping charges. 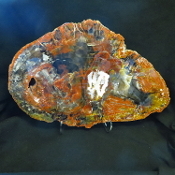 This AZ Petrified Wood table top measures 39 1/4 x 35 1/2 x 1 inch. Please email for shipping charges. 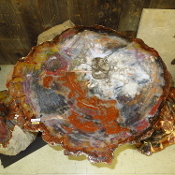 This AZ Petrified Wood table top measures 25 x 24 x 1 1/4 inches. Please email for shipping charges. 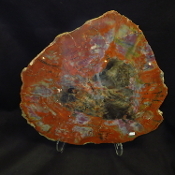 This AZ Petrified Wood table top measures 27 1/2 x 24 1/2 x 1 inch. Please email for shipping charges. This AZ Petrified Wood table top measures 20 3/4 x 16 3/8 x 1 inch. Please email for shipping charges. This AZ Petrified Wood table top measures 19 x 16 1/4 x 1 inch. Stand not included. Please email for shipping charges. This AZ Petrified Wood table top measures 18 3/4 x 16 1/2 x 1 inch. Stand not included. Please email for shipping charges. This AZ Petrified Wood table top measures 18 1/4 x 16 1/4 x 1 inch. Stand not included. Please email for shipping charges. 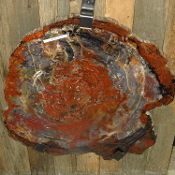 This AZ Petrified Wood table top measures 20 3/8 x 14 1/2 x 1 inch. Stand not included. Please email for shipping charges. 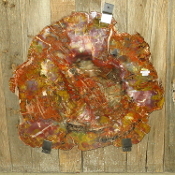 This AZ Petrified Wood table top measures 19 x 16 x 1 inch. Stand not included.Please email for shipping charges. 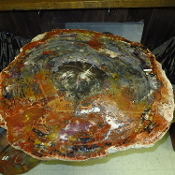 This AZ Petrified Wood table top measures 20 3/4 x 14 3/4 x 7/8 inches. Stand not included. Please email for shipping charges. This AZ Petrified Wood table top measures 19 x 15 3/4 x 1 inch. Stand not included. Please email for shipping charges. This AZ Petrified Wood table top measures 21 x 19 x 1 inch. Stand sold separately. Please email for shipping charges. This AZ Petrified Wood table top measures 20 x 18 1/4 x 1 1/8 inch. Stand sold separately. Please email for shipping charges. This AZ Petrified Wood table top measures 20 1/2 x 18 3/4 x 1 inch. Stand sold separately. Please email for shipping charges. 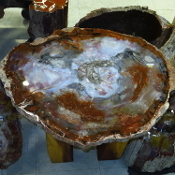 This AZ Petrified Wood Table Top measures 20 x 17 3/4 x 1 3/8 inches. Stand not included. Please email for shipping charges. This AZ Petrified Wood table top measures 20 1/2 x 18 x 1 inch. Stand not included. Please email for shipping charges. This Navajo Arizona Petrified Wood table top measures 23 1/2 x 18 x 1 1/8 inches. Stand not included. Please email for shipping charges. This AZ Petrified Wood table top measures 22 x 18 3/4 x 1 1/8 inches. Stand not included. Please email for shipping charges. 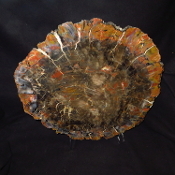 This of AZ Petrified Wood Table Top measures 21 1/2 x 16 x 1 inch. Stand not included. Please email for shipping charges. 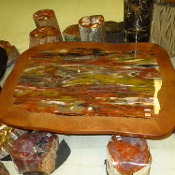 This AZ Petrified Wood Table Top measures 21 x 13 5/8 x 7/8 inches. Stand not included. Please email for shipping charges. 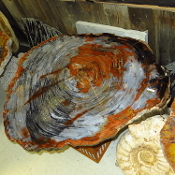 This AZ Petrified Wood Table Top measures 22 x 14 x 1 1/4 inches, it tapers down to 1/2 an inch thick. Stand not included. Please email for shipping charges. This AZ Petrified Wood Table Top measures 19 x 15 1/2 x 1 inch. Stand not included. Please email for shipping charges. This AZ Petrified Wood table top measures 18 x 17 1/2 x 1 inch. It is missing some bark. Stand not included. Please email for shipping charges. This AZ Petrified Wood table top measures 21 3/4 x 15 x 7/8 inches. Stand not included. Please email for shipping charges. 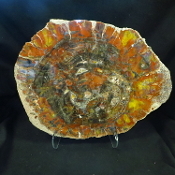 This AZ Petrified Wood table top measures 24 x 21 1/8 x 1 1/4 inches. Stand not included. Please email for shipping charges. 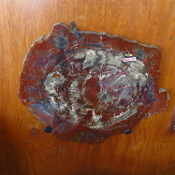 This AZ Petrified Wood table top measures 23 x 20 x 1 inch. Stand not included. Please email for shipping charges. 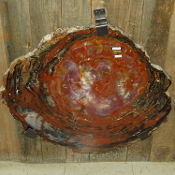 This AZ Petrified Wood table top measures 19 3/8 x 15 5/8 inches across. The thickness goes from 1inch down to 1/2 an inch. Stand not included. Please email for shipping charges. 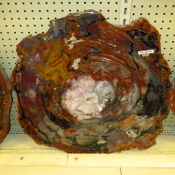 This AZ Petrified Wood table top measures 22 3/4 x 15 1/4 x 7/8 inches. Stand not included. Please email for shipping charges. This AZ Petrified Wood table top measures 22 1/2 x 17 3/4 x 1 inch. Stand sold separately. Please email for shipping charges. 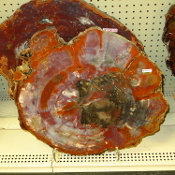 This AZ Petrified Wood table top measures 20 7/8 x 16 3/4 x 1 1/8 inches at the thickest point. Stand not included. Please email for shipping charges. 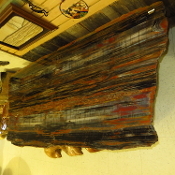 This AZ Petrified Wood table top measures 21 3/4 x 22 x 1 1/8 inches at the thickest point. Stand not included. Please email for shipping charges. This AZ Petrified Wood table top measures 24 1/4 x 19 3/8 x 1 1/8 inches. Stand not included. Please email for shipping charges. This AZ Petrified Wood Table Top measures 19 1/4 x 18 x 1 inch. Stand not included. Please email for shipping charges. 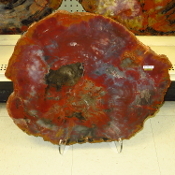 This AZ Petrified Wood table top measures 24 x 18 1/4 x 1 1/4 inches. Stand not included. Please email for shipping charges. This AZ Petrified Wood table top measures 19 3/8 x 18 1/2 x 1 3/8 inches. Stand not included. Please email for shipping charges. This AZ Petrified Wood Table Top measures 21 x 18 x 1 inch. Stand not included. Please email for shipping charges. This AZ Petrified Wood Table Top measures 20 1/2 x 17 x 1 inch. Please email for shipping charges. This AZ Petrified Wood table top measures 20 x 17 1/8 x 1 inch. Stand not included. Please email for shipping charges. This AZ Petrified Wood table top measures 22 x 18 x 1 inch. Stand not included. Please email for shipping charges. This AZ Petrified Wood table top measures 21 3/8 x 17 1/2 x 1 1/4 inches. Stand not included. Please email for shipping charges. This AZ Petrified Wood Table top measures 23 1/2 x 19 1/4 x 1 1/4 inches. Stand not included. Please email for shipping charges. This AZ Petrified Wood table top measures 20 x 18 3/4 x 1 inch. Stand not included. Please email for shipping charges. This AZ Petrified Wood table top measures 22 x 19 3/8 x 1 inch. Stand not included. Please email for shipping charges. 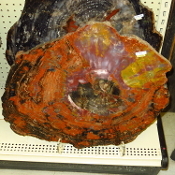 This AZ Petrified Wood table top measures 21 1/4 x 18 x 1 1/4 inches. Stand not included. Please email for shipping charges. 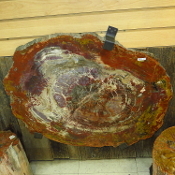 This AZ Petrified Wood table top measures 17 3/4 x 16 3/4 x 3/4 inches. Stand not included. Please email for shipping charges. This AZ Petrified Wood table top measures 19 1/2 x 18 1/2 x 1 inch. Stand not included. Please email for shipping charges. This AZ Petrified Wood table top measures 20 1/2 x 18 1/2 x 1 1/4 inches. Stand not included. Please email for shipping charges. This AZ Petrified Wood table top measures 23 x 24 x 1 1/2 inches. Please email for shipping charges. This AZ Petrified Wood Table Top measures 26 x 23 x 1 inch. Please email for shipping charges. This AZ Petrified Wood table top measures 19 3/4 x 18 1/4 x 1 inch. Stand not included. Please email for shipping charges. This AZ Petrified Wood table top measures 20 x 18 1/2 x 7/8 inches. Stand not included. Please email for shipping charges. This AZ Petrified Wood table top measures 19 3/8 x 19 x 7/8 inches. Stand not included. Please email for shipping charges. This AZ Petrified Wood table top measures 20 x 17 5/8 x 1 inch. Stand sold separately. Please email for shipping charges. This AZ Petrified Wood table top measures 21 1/2 x 17 1/2 x 3/4 inches. Stand not included. Please email for shipping charges. This AZ Petrified Wood table top measures 20 1/4 x 17 1/2 x 1 inch. Stand not included. Please email for shipping charges. This AZ Petrified Wood Table Top measures 27 3/4 x 22 x 1 inch. Stand sold separately. Please email for shipping charges. 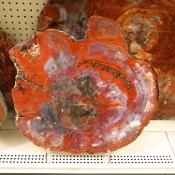 This stunning AZ Rainbow Petrified Wood table inlaid in wood measures 44 3/4 x 32 x 16 inches. Please email for shipping charges. 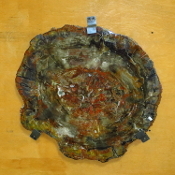 This AZ Petrified Wood Table Top measures 21 x 20 1/8 x 1 1/4 inches. Stand sold separately. Please email for shipping charges. This AZ Petrified Wood Table Top measures 28 x 20 3/4 x 1 inch. Stand sold separately. Please email for shipping charges. 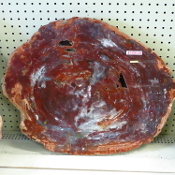 This AZ Petrified Wood Table Top measures 27 1/2 x 14 x 1 1/8 inches. Please email for shipping charges. This AZ Petrified Wood Table Top measures 26 5/8 x 17 3/8 x 1inch. It has a crystal pocket near the center. Stand sold separately. Please email for shipping charges. This AZ Petrified Wood Table Top measures 31 x 25 x 1 1/4 inches. Please email for shipping charges. This AZ Petrified Wood Table Top measures 71 1/2 x 30 3/4 x 5/8 inches. Please email for shipping charges. 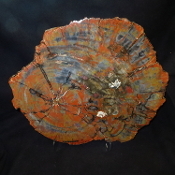 This AZ Petrified Wood Table Top measures 26 1/2 x 24 1/2 x 1inch. Please email for shipping charges. This AZ Petrified Wood Table Top measures 19 x 17 x 1inch. Please email for shipping charges. This AZ Petrified Wood table top measures 52 1/2 x 41 1/2 x 1 1/2 inches. Stand not included. Please email for shipping charges. This AZ Petrified Wood table top measures 22 3/4 x 18 3/4 x 1 inch. Stand not included. Please email for shipping charges. 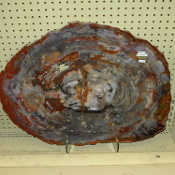 This AZ Petrified Wood table top measures 22 1/4 x 18 x 7/8 inches. Stand not included. Please email for shipping charges. This AZ Petrified Wood Table Top measures 19 1/4 x 18 x 3/4 inches. Stand not included. Please email for shipping charges. 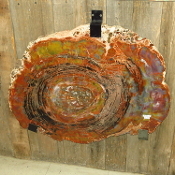 This AZ Petrified Wood Table Top measures 25 x 17 x 1 inch. Please email for shipping charges. This AZ Petrified Wood Table Top measures 27 1/2 x 21 x 1 1/8 inches. Please email for shipping charges. This AZ Navajo Petrified Wood table top measures 28X24 inches. Base not included. Please email for shipping charges. This AZ Petrified Wood Table Top measures 19 x 23 x 1 inch. Please email for shipping charges. This AZ Petrified Wood Table Top measures 18 1/2 x 23 x 1 1/2 inches. Please email for shipping charges. This AZ Petrified Wood Table Top measures 22 1/2 x 24 x 1 1/2 inches. Please email for shipping charges. This AZ Petrified Wood Table Top measures 21 x 15 1/2 x 1 inch. Please email for shipping charges. 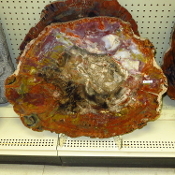 This AZ Petrified Wood Table Top measures 22 x 22 1/2 x 1 1/4 inches. Please email for shipping charges. This AZ Petrified Wood Table Top measures 19 x 17 3/4 x 1 inch. Stand not included. Please email for shipping charges. This AZ Petrified Wood Table Top measures 25 1/4 x 19 1/4 x 1 inch. Stand not included. Please email for shipping charges. This AZ Petrified Wood table top measures 31 3/4 x 24 1/4 x 1 1/2 inches. Please email for shipping charges. This AZ Petrified Wood table top measures 22 1/4 x 19 1/4. The thickness varies from 1 inch to less than 1/8 inches. Stand not included. Please email for shipping charges. 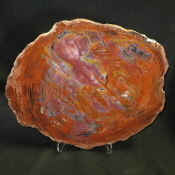 This AZ Petrified Wood Table top measures 19 x 22 x 1 1/4 inches. Please email for shipping charges. This AZ Petrified Wood plank table top measures 61 x 21 x 1 5/8 inches. Base is Included. Please email for shipping costs. This Navajo AZ Petrified Wood table top measures 21 1/2 x 25 x 3/4 inches. Please email for shipping charges. This AZ Petrified Wood table top measures 19 1/2 x 26 1/2 x 1 inch. Please email for shipping charges.